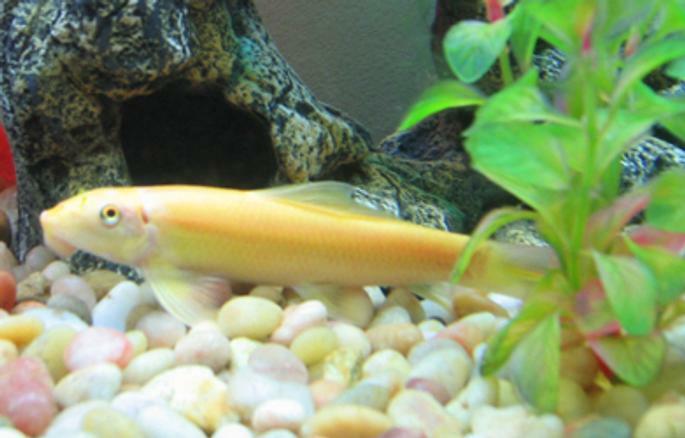 freshwater fish - gyrinocheilos aymonieri - gold algae eater - I have a 55 Gallon Freshwater Tank... I have 1 Neon Tetra (19 died), 3 Black Skirt Tetras, 3 Gold Algae Eaters, 1 Gold Snail, and 1 Blue Gourami... I'll be tossing in a Piranha soon... just kiddin! Photo Caption: I have a 55 Gallon Freshwater Tank... I have 1 Neon Tetra (19 died), 3 Black Skirt Tetras, 3 Gold Algae Eaters, 1 Gold Snail, and 1 Blue Gourami... I'll be tossing in a Piranha soon... just kiddin! This picture has been rated : 69 times.